Moviegoers who are only familiar with Disney's popular 1991 musical version of Beauty and the Beast may find themselves surprised or even confused by Jean Cocteau's 1946 adaptation of the classic fairy tale. A more direct adaptation of the original fairy tale by Mme. Leprince de Beaumont, Cocteau's Beauty and the Beast (La Belle et la Bette) tells a vastly different story than the one members of the Disney generation have come to know and love. It's a darker tale, casting the Beast as perhaps an even more tragic hero, trapped in his castle through no fault of his own. When we first meet Belle, she's an almost Cinderella-like figure, servant to her spoiled sisters, who refuse to lower their standard of living even after their family has fallen on hard times. So all the housework falls to the humble Belle, while her sisters go out the town, to much ridicule from the local villagers. 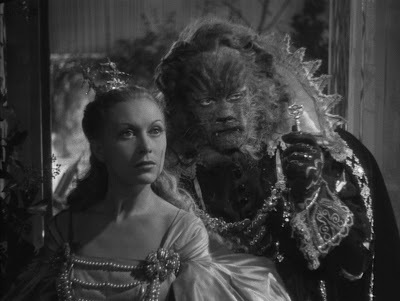 Josette Day as Belle and Jean Marais as the Beast in Jean Cocteau's Beauty and the Beast. However when Belle's father finds out this his fortunes may have changed, he sets out to collect his fortune, asking his three daughters what gifts they would like him to bring back from the city. Belle's sisters ask for countless extravagant gifts, but Belle simply asks for a single rose. It turns out that her father's creditors have already beaten him to his newfound wealth, so he heads back home, defeated. But along the way he becomes lost, and finds his way into a mysterious and enchanted castle, where statues come to life and candelabras are held by seemingly real, animate arms coming out of the walls. Determined not to return home empty handed, he plucks a rose from the castle's garden to bring back to Belle, only to be confronted by the monstrous Beast. The Beast tells him the penalty for stealing one of his roses is death, but he offers him a reprieve - if he can convince one of his daughters to take his place, he will allowed to live. The Beast then sends him on his way, with his promise to return in three days. Not wanting his daughters to die in his stead, he plans to return as the Beast requested, but Belle steals away on the Beast's enchanted horse, Magnificent, and vows to stay with the him in order to save her father. The Beast is instantly enamored with her, and gives her the run of the castle, with the promise that she will only see him once a day, at 7 PM, when he will come to dinner in the Great Hall and ask the same question - "will you be my wife?" 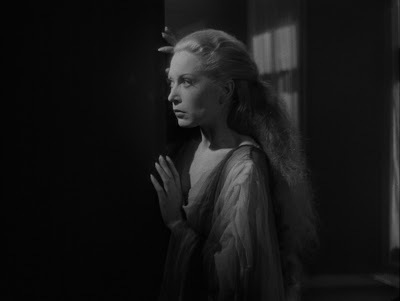 Josette Day as Belle in Jean Cocteau's Beauty and the Beast. In the eyes of today's audiences, Beauty and the Beast may seem a bit quaint, even naive. Cocteau's opening written introduction, imploring audiences to suspend their disbelief and look at the film with the eyes of a child, looks strangely innocent by today's standards. But there is an underlying darkness at work here despite its almost childlike simplicity. The Beast is a far more tragic figure here, cursed with his hideous looks, (rendered by still impressive makeup effects by Hagop Arakelian) through no fault of his own, by vengeful spirits seeking revenge upon his parents for not believing in them. His constant pining for Belle borders on the pathetic, and Cocteau makes sure to keep the Beast in a sympathetic light. Even in the end, when he takes human form, Belle is disappointed by his looks, realizing that she had fallen in love with the Beast as he was (not to mention the fact that he took on the human form of her brother's best friend, who is killed in his efforts to raid the Beast's castle). The film's focus stays on the romantic interplay between Belle and the Beast, and Cocteau conjures up a palpable sense of magic. 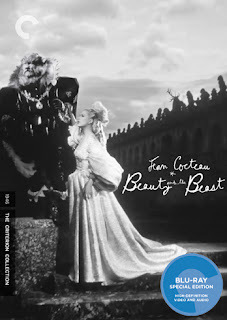 Criterion's blu-ray treatment impressively captures the film's dreamlike atmosphere, each sparkle of Magnificent's mane seems to pop off the screen, and Belle's now iconic entrance into the Beast's castle is more breathtaking than ever. The extras are all repeats from the original Criterion release, and while they don't really do much to place the film in its historical context (outside of the two commentary tracks), they do provide some interesting, vintage insight into the production of the film (including its excellent makeup). There is also an option to view the film with Philip Glass' opera based on the film as the soundtrack, but the original score is really the way to go. The real star of the show here is the film itself, which remains not only a landmark children's film, but a landmark in fantasy filmmaking as well. Coming out of France just after the end of WWII, Beauty and the Beast is the purest form of escapism. Innocent, yes, but beautifully so. Cocteau's enduring fable remains just as enchanting and charming as it ever was, and now thanks to the Criterion Collection, it has never looked better. BEAUTY AND THE BEAST | Directed by Jean Cocteau | Stars Jean Marais, Josette Day, Mila Parély, Nane Germon, Michel Auclair, Marcel André | Not rated | In French w/English subtitles | On DVD and Blu-ray Tuesday, July 19.